One of the significant challenges in current markets for medical technology is the evolving definitions that dictate the nature of the competitive landscape. The unrelenting economic forces underpinning medtech — to drive down the cost of healthcare — have forced manufacturers to respond to competition that is broader, more aggressive and centered considerably less on “features” than on “benefits”, with benefits under intense scrutiny. One of the significant challenges in current markets for medical technology is the evolving definitions that dictate the nature of the competitive landscape. The unrelenting economic forces underpinning medtech — to drive down the cost of healthcare — have forced manufacturers to respond to competition that is broader, more aggressive and centered considerably less on “features” than on “benefits”, with benefits under intense scrutiny. 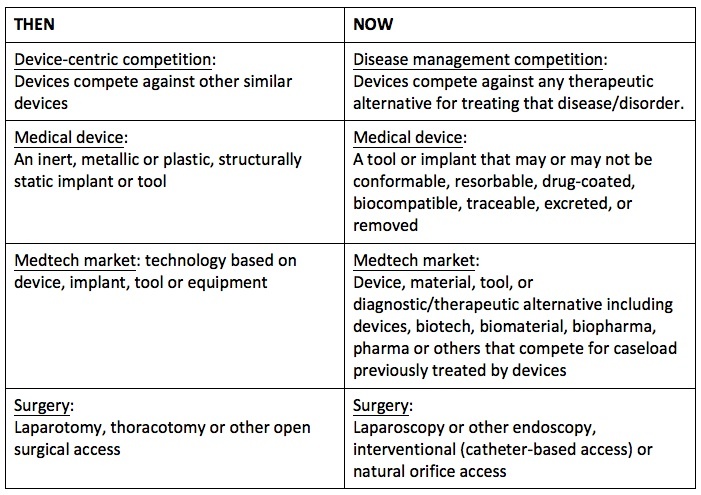 Healthcare systems have limited the number of contracted vendors and the lower prices have reduced manufacturers’ margins, which has shaken out those unable to compete on cost and resulted in a market increasingly characterized by a much smaller number of competitors who must compete against all therapeutic alternatives, regardless of the nature of the technology approach. In a very real sense, medical technology has in fact enabled these forces as manufacturers have responded to the market forces by developing products that compete, cost effectively, on a broader therapeutic scale. Innovators have been steadily stretching the boundaries of possibility through advanced materials technologies development (polymers, hybrids and embedded drugs, nanomaterial and other coatings, etc.). Researchers in basic and applied sciences are combining understanding from multiple disciplines impacting medtech performance — the benefits of understanding in cell biology, molecular biology, biochemistry, chemistry, flow dynamics, computer science, statistics, physics, and others are increasing the performance in vivo of new medical technologies. As a result, the nature of medical technology has changed, particularly relative to competition. Below is a THEN and NOW view of medical technology.